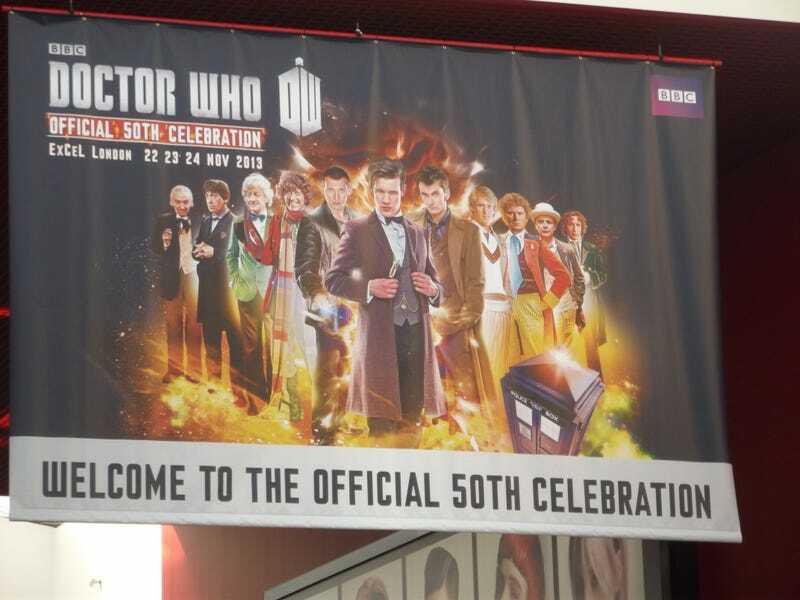 On Saturday November 23rd, as Doctor Who celebrated its 50th Birthday, around 8,000 people descended on London's ExCel Convention Centre - with sonics, fezzes and impossibly long scarves in tow - for the BBC's Official Anniversary Convention. And I, camera in hand, was one of them! It was a bright and early day, arriving at the ExCel just in time for doors to open at 8.30, letting in swathes of people to be ushered into ticket scanners and have lanyards thrust at them (my ticket stream was designated as 'Weeping Angel' rather than 'Ice Warrior', so mine has a particularly angry Angel glaring out of it, with the date and a little 'I was there!' sticker). Everyone was then ushered into one of the centre's massive hangers, waiting for the actual Celebration to begin an hour later, but the excitement was in the air. The buzzing of sonic screwdriver toys filled the hall, an irish chap in front of us was clad in full Fourth Doctor regalia, handing out jelly babies to passers by. A running theme at this event was the unifying joy of Doctor Who fans - people were chatting to strangers like they were best friends, taking pictures of some of the spectacular cosplayers, from the tinest toddler to the oldest diehard, the love for Doctor Who permeated everyone there. Not even the honourable British past time of politely queuing (and there was an awful lot of queuing!) can stop a Doctor Who fan. Eventually the wait was over, and the masses surged towards the entrance to the Convention itself, which was amazingly decked out as the BBC's Lime Grove studios - Doctor Who's very first home back when it started - complete with a recreation of I.M Foreman's junkyard doors to walk through, to walk past a replica of the very first TARDIS and into the main hall. By the end of the day, that TARDIS was so popular, a queue stretched from one end of this massive hall to the other, just to take a picture of it! Like I said, we Brits love a queue. Before any of the panels started, I sat down to listen in on Graham Norton's BBC2 radio show, which was broadcasting live from the Convention Saturday morning (You can catch it on the iPlayer here) - unfortunately the audience couldn't hear Graham recording it that well, but you could certainly hear us when Matt and Jenna made an appearance! Next up, another impossibly long queue (thanks to a technical fault delaying it) and the Regenerations Panel, which was dedicated to the Classic series - headed by Colin Baker, Sylvester McCoy, Peter Davison, and for one day only, the incredible Tom Baker. The Doctors are all marvellous public speakers - with Sylv and Colin jokingly chatting about how they both 'ruined' Doctor Who in the 80's, and Peter having much fun getting the Sign Language interpreter on stage to perform the symbol for 'Cleavage' whenever he spoke about Nicola Bryant! - but the panel was dominated by the inescapable aura of Tom Baker. That booming voice can still hold an audience in rapture, and he had everyone howling with laughter whenever he spoke. Next up was The Eleventh Hour, dedicated to the 2005 revival and, given the guest list, more specifically the 2010-onwards era of Matt and the Moff, who were both joined by Jenna Coleman and producer Marcus Wilson. Unlike his fellow Doctors, Matt was perhaps a little more shy given that he was being watched by a huge crowd of people declaring their undying love for him, but the panel was still fun and informative (Steven told a wonderful tale about the origin of the idea behind the Weeping Angels, which featured a spooky collapsing Church graveyard he saw on holiday, and a disappearing angelic gravestone!). Matt, on who if he could pick anyone to be his companion - First choice, Jenna-Louise of course... but if Jennifer Lawrence was available, he wouldn't complain (Tumblr users, go nuts)! ... or not. This queue was so big, it stretched around the whole shop area. Twice. So I went to have a wander at some of the displays instead! This Dalek guarded the entrance to Mike Tucker's model workshop, which held a veritable treasure trove of incredible models from both Classic and New Series. A reproduction of the titular Hand of Fear from, well... The Hand of Fear (told you it was titular!). The absolutely incredible model of Tom Baker etched into stone for the story that introduced Louise Jameson's Leela, The Face of Evil. The gorgeous model of the Firebird from Cold War earlier this year, proving that even in 2013 there's a place for model work amongst the CGI whizzbangs. After a bit more queuing for an... ahem, Doctor's appointment (more on that at the end), I took the chance to have another wander around the exhibitions whilst waiting for the screening of the special to begin, which lead me to lot of lovely props and costumes on loan especially for the Convention. Like this Tractator! Actually surprisingly creepy. Or my boy Rory's clothes from Vampires of Venice. I'm now 2 for 2 with 'being near clothes worn by Arthur Darvill'. ... placed in shocking contrast right next to her slightly-a-lot-less-gorgeous miniMetro from K-9 & Company. Turns out, Sontarans are also a big fan of the process of making and eating Popcorn - mistakenly believing that humans burn 'corn creatures' alive until they explode, and then eat their still-screaming remains (hence that noticeable 'squeak' when you munch on popcorn) for sustenance. How very Sontaran! As for the episode, well... you know how that went, surely? Suffice to say, at several points I thought that the crowd might actually bring the roof down, the roaring and clapping and general swaying of buzzing Sonic Screwdrivers were that loud. It was amazingly poignant to be surrounded by all these people who love this silly little show about these daft men and their flying blue boxes, to tangibly see the love for Doctor Who that has carried it through the past 50 years, and will carry it on through the next 50. I can't think of a better way to have watched the special. The great hero of the Doctor Who anniversary special is... John Rawls? But finally, back to that Doctors appointment I was talking about... well, you have to come away with a bit of swag from a convention, right? They even left some space for me to eventually track down Paul McGann's autograph! It was absolutely incredible to meet these guys, to shake their hands and say thanks for all the brilliance they've delivered as The Doctor. It was an awesome way to remember this very special weekend by, and I'll treasure it forever.